Change abounds in healthcare, at a seemingly faster pace each passing day. Healthcare providers are asked to do more with less. Physicians are asked to adapt to new economics and quality scrutiny. Vendors are asked to forge stronger, creative relationships with hospitals. All must combine efforts to ensure the best quality care for our patients at prices they are willing to pay. Under this backdrop, value analysis plays a more critical role than ever before. Value analysis uses evidence-based and data-driven decisions to ensure our physicians and clinicians have access to quality products at the right time and at the right price. Under healthcare reform, hospitals will literally succeed or fail based on the quality and affordability of the care they deliver. 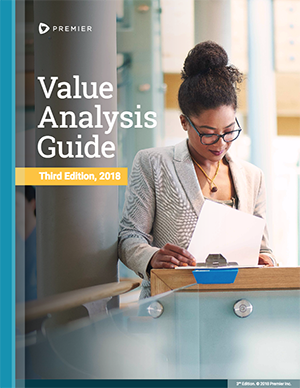 Download Premier's new Value Analysis Guide to discover how to develop a strong, structured value analysis process as a strategic tool. Download our new best practices guide for value analysis program success.